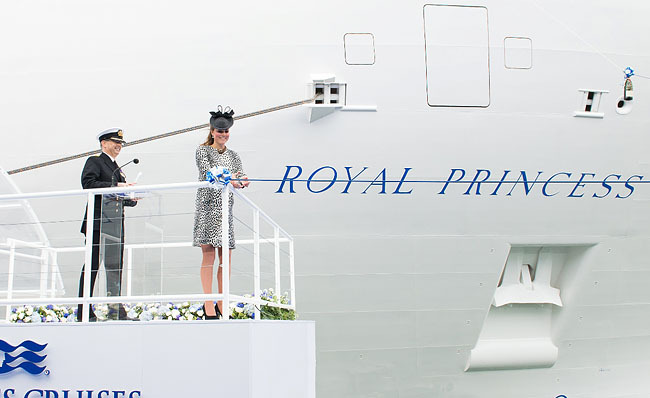 The Royal Princess, Princess Cruises’ first new ship since 2008, was christened this morning by Her Royal Highness Catherine the Duchess of Cambridge, otherwise known as Kate Middleton. The event got started with the Band of Her Majesty’s Royal Marines Portsmouth and The Pipe Band of 1st Battalion Irish Guards. Then British singer and songwriter Natasha Bedingfield sang her hit “Unwritten,” wearing a very bright outfit on this typically overcast English day. Then Kerry Ellis, a British stage actress, sang and the harmonic sounds of Mass Ensemble’s percussive orchestra filled the air. 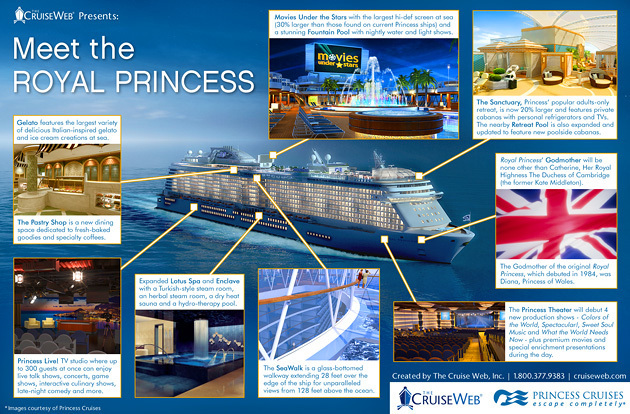 After the performances, President and CEO of Princess Cruises Alan Buckelew gave a quick speech introducing the Royal Princess as an exciting evolution to Princess’ fleet and introducing the roughly 8-months pregnant Kate Middleton as a godmother with style, grace and compassion for others. 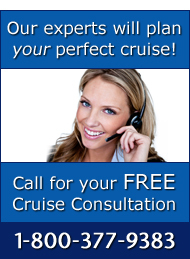 Then Kate officially named the ship and blessed her before cutting a ribbon to release a magnum of Moet & Chandon Brut Imperial Champagne that smashed on the side of the ship. Ever the style icon, Kate’s dalmatian print dress is actually a coat that runs about $250 and can be purchased online from John Lewis, a British department store. This is said to be Kate’s last official engagement before the birth of her and Prince William’s child. What do you think, will Kate Middleton bring good luck and fortune to the Royal Princess?